Many people have difficulty knowing what to say to a dying person. They aren't sure if they should avoid the subject of death or encourage the person to talk about it. They feel it would be rude to ask questions, and so they don't know what to talk about. They may leave the dying person feeling ignored by engaging in meaningless small talk or make the person feel uncomfortable by persistently dwelling on death. It isn't always easy to know what to say to someone who is dying soon, but there are some principles that are helpful to remember. It's natural to want to avoid the uncomfortable subject of death with a person who is dying, but avoiding the topic can seem callous ("Why is she talking about the weather when I'm lying here dying?") or perhaps even cowardly. Know that the person dying isn't going to forget that they're dying, so bringing it up isn't going to abruptly remind them. Though you might be uncomfortable, talking about death with someone who is dying is quite a gift - imagine how frustrating it must be if they want to talk about it and nobody's willing to. Ignoring the impending death - especially when the person tries to bring it up - is insulting. If the dying person is upbeat, match their demeanor. If the dying person is somber, try not to counter that with cheerfulness. Be a listening ear; ask how they feel about what's happening and, if appropriate and you intend on following through, ask what you can do for them after they're gone. Try to avoid false promises ("I will climb Mount Everest to spread your ashes") but give assurances that you can actually follow up on ("I'll check on your husband and kids often"). Be truthful, be willing to listen, and don't ignore what's coming in an effort to keep everyone upbeat. While it may feel difficult to know what to say to a dying friend or loved one, the following advice will help you feel more comfortable. One of the most loving things to do for a dying person is to simply listen. Most people say, "how are you," but simply keep talking after the person tosses out the obligatory, "fine." Slow down, sit down, and really listen to what the dying person has to say. Some people want to share important memories at the end of their lives and may feel comforted when someone stops to listen to a favorite story from his or her childhood. Others may have worries and anxieties they want to share but have not had anyone willing to sit still and really hear these thoughts and feelings. Listen without passing judgment and only offer support and affirmation. Sometimes a dying person will want to discuss death or the dying process. This can be very uncomfortable for close friends and family members to hear or discuss, but it is especially important that the dying person gets to voice his or her concerns and questions. No friend or family member should feel like they have to have all the answers, but it isn't fair to change the subject every time the dying person brings it up. He or she may feel the need to talk about funeral plans, organ donation, or making a will. Not everyone has to talk with the dying person about death and dying, but he or she should always have someone available who is comfortable with the subject. Sometimes when a person is close to death, he or she will begin to see and hear things that aren't audible or visible to anyone else. If the dying person is agitated by these things, it makes sense to try to re-orient the person to his or her actual surroundings. However, if the dying person is comfortable with the things he or she is seeing, it is usually kinder not to argue with the person about the reality of what he or she is seeing. Some people see relatives who have passed away, some see angels, and some dying people hear music. Still, others may see and hear things that are unpleasant or frightening. Hallucinations are a normal part of the dying process, and family members should not be anxious when they occur. One of the most difficult situations can happen when someone suddenly finds out that an acquaintance is dying. This is a very personal disclosure, and without a close relationship to support it, the conversation can become very awkward. It's always appropriate to say, "I'm so sorry to hear that." The dying person may end the conversation there or change the subject, or he or she may choose to share more details of the situation. The most compassionate thing to do is listen, and a sincere offer of help in the form of meals or assistance with everyday tasks such as shopping or housekeeping is always appropriate. If the dying person refuses help that's OK as well. Let the dying person know you are thinking of him or her, and that your offer of help is open as long as it's needed. Do not offer help if you don't want to help, don't have time, or know you will refuse when asked. "I'll bet you wish you didn't smoke/exercised more/ate better." Instead, say, "Do you want to talk about any regrets you have?" "You know if you don't accept Jesus right now you're going to hell when you die." Instead, approach it more gently, "May I speak to you about my faith and what I think happens to us when we die?" "Don't haunt me, OK?" This statement is a sad attempt at humor and in poor taste. Instead, focus on how they will live on in other ways: "You'll remain in my heart" or "I'll think of you every time I go to our favorite cafe." "You don't know how hard this is for me." It may be difficult for you to say goodbye to someone who is dying, but their experience is what's important at this moment. Instead, focus on their experience: "Is this hard for you?" "You're going to beat this - you'll be OK." Dismissing the inevitable won't make them feel better. Instead, talk frankly about death if that's what they want. Don't end your conversation with an awkward "See you later" when you both know it to be untrue. A simple "Goodbye, friend" or "Goodbye, my dear" is appropriate and can be accompanied by a hug or kiss if appropriate. If you and the person are spiritually inclined, you can offer to pray for them in parting or say something along the lines of, "God bless you on your journey." Feel free to add a complimentary statement to your goodbye such as, "It has been a pleasure having you in my life." The most important thing to remember when talking with someone who is dying is to speak from the heart. Be sincere, compassionate, and willing to listen. Don't let discomfort with death affect the ability to support a friend or family member who is dying and remember to offer help and sympathy to even more casual acquaintances who are dying. 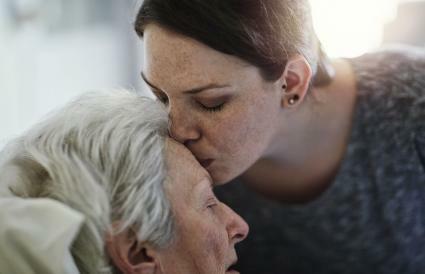 A kind word and a listening ear can support and encourage a dying person during the end of his or her life better than any bouquet of flowers or a sappy card.